Cycling the Yaeyama islands is fun! 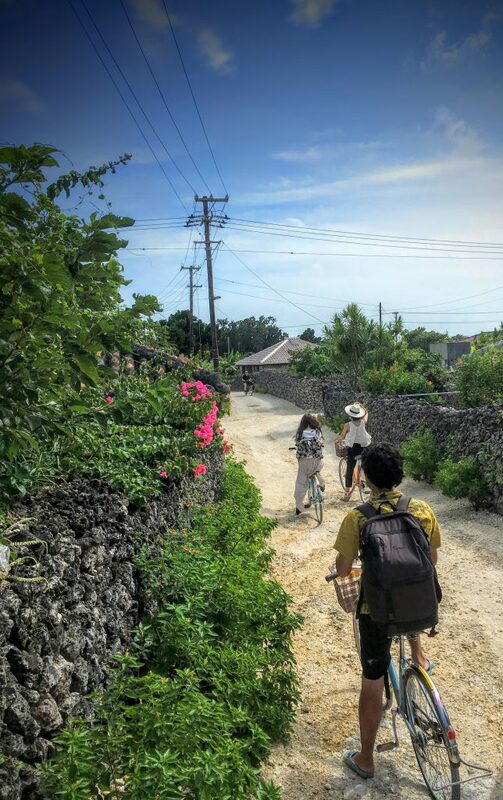 Every island has it’s own character, with Ishigaki being mountainous, Iriomote has a remote atmosphere, Taketomi and kuro are small and easy for a day trip on the bike. Choose carefully your activity and bike as distances can be longer and circumstances a bit harder than expected. One of the good things in the Yaeyama islands is road safety and polite people. With vending machines around almost every corner, quenching the thirst is not so difficult. For cycling in Ishigaki city area, a normal bike is fine. Further away, we wouldn’t recommend to go by bike. Especially in the hot summer months, the heat and the mountainous landscape with fairly long distances, isn’t comfortable by normal bike. We recommend experienced cyclists to bring their road bike and go for a one day round trip (around 120 km) or two days on a more relaxed pace. We wrote a post on how to rent a bike in Ishigaki. Iriomote is really good for cycling around bij road bike as well. Iriomote is a nature island with longer distances between the small villages. Iriomote doesn’t have cities to bike around. Take the bike on the ferry and cycle for example from Ohara to Uehara port (60km). For a fun, authentic day trip, go to the smaller Taketomi or Kuro island and rent a normal bike. This is a fun activity for families with kids. Bicycle rentals are available on the islands. These rental companies have a free pick up and return service from and to the ferry port. The lucky ones that stay at one of the resorts in Kohama island, can rent a (electric) bike or scooter at the resort. Kohama has a fine landscape to bike around. The island is not too big and has a few hills and view points. Great Earth is in Ishigaki and Iriomote.